India unveiled her so-called veil of Mother of Democracy when enmity against Islam and Pakistan was adopted as a motto of election campaign. Foundation of this enmity was laid by Narendra Modi as Chief Minister of Gujarat by genocide of Muslims. The hatred against Muslims became a successful technique for elections that in 2013, Congress was forced to adopt it was well. Congress had to face the defeat in the elections because Congress representatives made speeches against Pakistan but during election campaign Indian Muslim were tortured. After Modi came into power his first attempt was to convert Muslims into minority in Indian Held Kashmir. Kashmiri Muslims resisted against this plan; Indian army fueled the fire of violence in order to suppress the protests. Now the situation is that whole Kashmir is under curfew. Kashmiri do not care the curfew, they are staging protests by carrying Pakistani flags. When Kashmiri get martyred they are buried in the green flag of Pakistan and India is powerless in front of unarmed Kashmiris. Indian Generals and Civil departments in Indian Held Kashmir are taking construction of Gawadar and trade route to China as a good tiding for them. That is why RAW is executing all the terrorist activities in Karachi via London while Britain is playing the role of absent facilitator. In the campaign against Pakistan by India when Modi mentioned Balochistan especially; as a token of thanks Barahamdagh Bugti mutilated the history of Balochistan while thanking Indian Prime Minister. If we look at the Indian interference in Balochistan for her imperialist designs and exploiting so-called Baloch leaders (separatists); it was started in March 1948, when Khan of Qalat Mir Ahmed Yar Khan signed on the deal to join Pakistan. 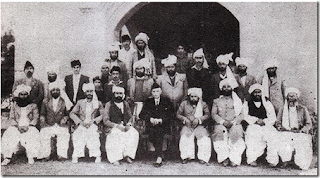 His brother Mir Abdul Kareem Khan rejected this accession and announced accession of Qalat with Afghanistan with the support of few likeminded tribal chiefs like Ghaus Bakhsh Bazanju and others. They formed a guerilla force and started attacking govt. installations especially military centers. In this regard Kabul and New Delhi supported them by funds and weapons. Khan of Qalat has decided accession with Pakistan after considering all concerns. 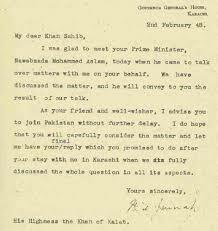 On 07 March 1948, the accession was to be signed in Karachi. 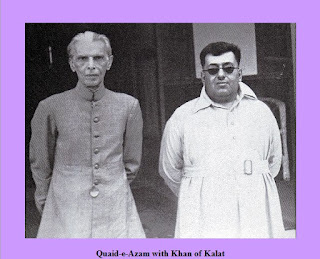 Quaid-e-Azam was shocked when Khan of Qalat did not reach on the given time and date. Quaid was told that brother of Khan of Qalat and few other Chiefs are not ready to accept the formula of division of India. He knew that India is behind this who has already captured Juna Garh and Hyderabad Muslim majority states and has also attacked Kashmir for this purpose as well. Khan of Qalat also knew that accession of Qalat to Afghanistan is unnatural, against the geographical division and will leave public of Qalat secluded forever. He mentioned this several with his advisors. After long discussion he reached Karachi and signed accession with Pakistan on 27 March 1948. Brother of Khan of Qalat started treason against the accession to Pakistan and started violent activities against Pakistan which was starting point of Indian interference in Balochistan. The activities of terrorism increased beyond limits, Nawab Abdul Kareem was arrested on the orders of the Quaid. In this regard first military operation in Balochistan was started in 1948. Of course at this time when militants were armed with Indian provided latest weapons, Pakistan had no other option to utilize military against Baloch militants. The whole militants campaing was started as a reaction of accession of Qalat while rest of the Balochistan was already with Pakistan since British rule. As long as brother of Khan of Qalat remained in prison, Balochistan remained peaceful. In 1955, on the recommendation that Nawab Abdul Kareem Khan will has accepted accession of Qalat to Pakistan and will remain peaceful and loyal to Pakistan; he was released. Remaining peaceful for one year, he got active once again. Before starting his militant campaign he contacted likeminded Baloch chiefs and asked them to struggle for separation; majority rejected the proposal, few gave silent support, however, Muree Mir, Mir Gohar Khan, Zahri tribes, and Nawab Naurez Khan not only agreed to support him but also targeted military and govt. installations. Punjabis living in Quetta and other cities for last 4 generations were murdered and damaging rail-roads also became routine. They went bit beyond today’s BLA. This was started as well that who is providing such costly and modern weapons to the militants and financing them. At least it was decided to conduct military operation in 1958. Nawab Naurez Khan and his two sons were arrested as well. The remaining leadership of separatists fled to Afghanistan and were given safe heavens. Sons of Nawab Naurez Khan were sentenced to death. Many Baloch chiefs joined Pakistan govt. procured funds in the name of development . These funds were transferred in the personal accounts of chiefs in spite of being utilized for the development of the public. Pakistani govt. also remained silent for the peace in the province. With the fall of Dhaka in 1971, militants once again got active in Balochistan. Now the terrorism was done in the name of deprivation of the area. Astonishingly, now this slogan is being raised by those chiefs who are all in all in Balochistan and they enjoyed funds from the govt. as well. In this way, right after the 1971, the military operation in Balochistan once again became inevitable as well. The only difference was that including Nawab Akbar Bugti and other big tribes were in favor of the operation and supported govt. The militancy of recent years which has mostly been controlled, was started when General Musharaf signed historical deal with China for construction of Gawadar. With the start of construction of Gawadar; anti Pakistan foreign powers established two groups for militancy and propaganda. One group was responsible for propaganda against Pakistan army through columns, talk shows, etc. pro-Indian groups in Pakistani media blamed Pakistan army. The other group was responsible for terrorist activities like targeting military and govt. installations, sabotaging passenger trains through remote control bomb blasts, target killing, bomb blasts at public places and destroying electricity and gas transmission lines. 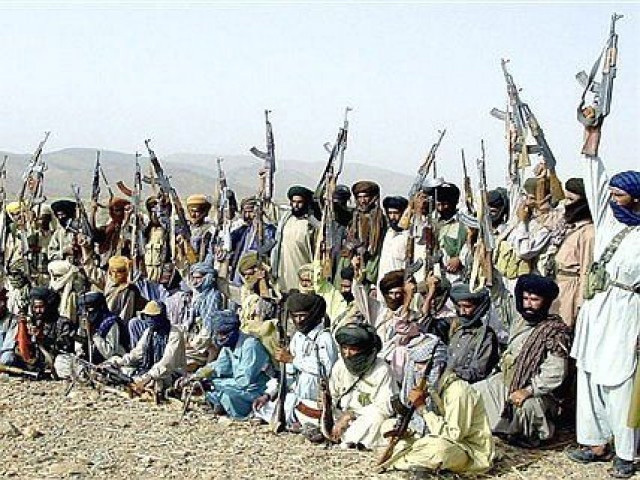 During this militancy, on 28 April 2006, Baloch militants announced exiled govt. of Greater Balochistan in Jerusalem Israel. After this on 12 August 2009, Council for Independent Balochistan was established. Seminars were arranged in Western countries especially USA. The financial needs were met by Indian govt. With the start of work on CPEC, not only India but other Islamic countries are also concerned about it. Before this only India was busy in sponsoring militancy in Pakistan especially Balochistan since 1948 joined by Israel. But after CPEC Project RAW agents like Kulbhushan Yadev have been operating not only from Afghanistan but Iran as well. 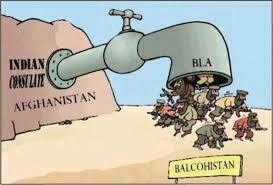 The terrorism in Balochistan was developed to suicide bomb blasts. Pakistan has given uncountable sacrifices for peace in Balochistan. In the way Pakistan’s treasury was looted in Balochistan world saw its glimpse few months ago when billions of currency was recovered. Our brave soldiers have sacrificed their lives. Pakistan is still ready to completed CPEC at any cost and protect nuclear assets of Pakistan even at the cost of their lives. Date: 18 to 24 September 2016.